Kaine blasts Republicans as "fiscally reckless" rather than "fiscally responsible." Kaine on Obama: "He said he'd end the war in Iraq, and he has. He said he'd draw down troops in Afghanistan, and today every Virginia National Guard unit is home for the first time in a decade, and we're so happy. He said he'd go after bin Laden and take out al Qaida, and with our great SEAL team, that's exactly what he did.... He promised he'd fight for equal pay for women, college affordability for students, fair treatment for LGBT Americans, and he's kept his word. He's a tough leader who gets results for the American public." Alright folks - it's time for the DNC, prime time coverage. While you watch, leave comments and follow along with social media accounts as well as extra information and trivia. US Senate candidate in Virginia Tim Kaine in Charlotte: "Tough times don't last. Tough people do. Let's come together, show how tough we are and prove our best days will always be ahead of us." As Wolf Blitzer is explaining live on CNN, the set-up for the DNC is very different than RNC. While the entire floor was covered with delegates at the RNC, the DNC is in the arena stands as well. What is my fair share? My husband and I were doing well four years ago, but now we just make ends meet. And do we get anything from the government? Not one red cent. My husband built his business 100% by himself. So how much more do we have to pay? Tony where have you been for the last 4 years. I have been working and going to college full time. My income has increased. My taxes have been less and I can afford to buy an Amercian car. President has made a huge difference in my life nd I know he will continue to do that for the American people for the next 4 years. Not that u care but I am 63 years olf, female happily married and a registered voter. “@BenLaBolt: Reg Voters in CNN poll today on whether GOP convention made them more or less likely to vote Romney More 36% Less 46%” Agree? @Steve Krakauer mayor of El Paso, Texas? Handmade from wood RT @baseballcrank: Carter appearance soothing reminder to Obama, they'll be giving him participation trophies at DNCs. He's a Texas State Representative. Cory Booker's opening speech sharp, on target, compelling! 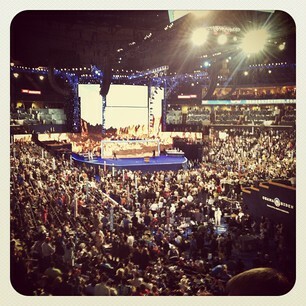 Nevada Senator Harry Reid speaks at the Democratic National Convention. "Pyromaniacs shouldn't blame the firefighter," Wexler says of Republicans arguments against President Obama. Vicki Kennedy live now with Wolf Blitzer. Ted Kennedy's wife says she was very moved by the crowd reaction. Minneapolis Mayor R.T. Rybak to Dem convention floor, "President Obama deserves every gray hair on his head." Speaking now at the DNC: Rep. Jared Polis from Colorado, "I'm Jewish. I'm gay... first and foremost, I'm an American." An email from Michelle Obama on behalf of her husband's campaign to supporters: "Tonight I'll take the stage in Charlotte to talk about why my husband -- and our president -- is the right man for the job." Email is a fundraising pitch. Hey, no one attacked Romney. We just pulled some old video from the past. Thought Republicans loved old movies, old times, good ole days. This is President Obama's second convention. So will he be redefined in 2012? A discussion from Peter Hamby's CNN.com/Live show today. I am from Texas and have been a lifelong democrat, but I certainly have not been impressed these last 4 years. I am very seriously rethinking my voting in November. 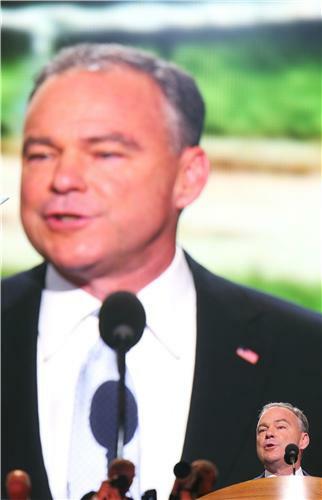 TRIVIA: Who was the keynote speaker at the 2004 Democratic Convention? You are all correct. Watch more about that on CNN's "Convention Flashback" on CNN now. Obama looked so much younger in 2004. Must be a stressful job. Seems every president ends up with gray hair after their term...must be something to that.